Now settin' sail monthly! In "The Housesitter," SpongeBob looks after Mr. Krabs' house and fends off a fishy cat burglar. In "Raising the Curtain of Evil," Patrick has to think fast to reconstruct SpongeBob's latest issue of Mermaid Man, resulting in a bizarre reading experience. James Kochalka writes and draws "SpongeBob Finds a Cave," in which SpongeBob finds...well, a cave. But this cave has a magic hot dog! 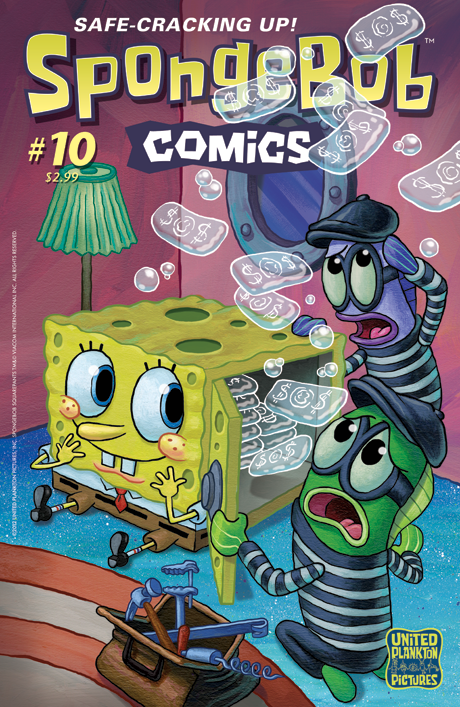 Plus: Plankton takes on Mermaid Man, Squidward paints a portrait, and Sandy Cheeks invents a robot so incredible that only you, the reader, could possibly draw it!